BBC Radio Bristol - Speechbubble, Episode 3: Mark Hurman, Judy Darley, Dan Squire, Neil Green, Angie Belcher and Jem Roberts. Episode 3: Mark Hurman, Judy Darley, Dan Squire, Neil Green, Angie Belcher and Jem Roberts. Bristol comedy legend Mark Olver introduces six exciting new local comedy performers. Featuring Mark Hurman, Judy Darley, Dan Squire, Neil Green, Angie Belcher and Jem Roberts. 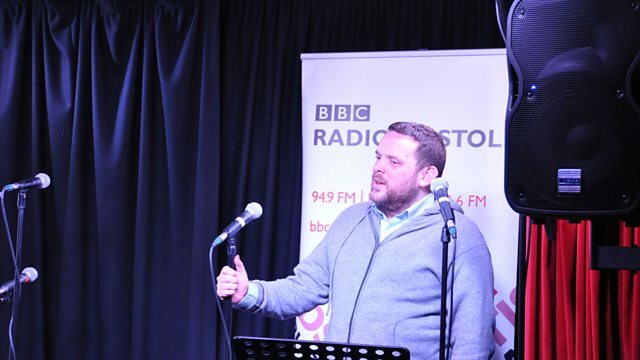 Mark Olver introduces Speechbubble: a fun, funny and exciting six part series on BBC Radio Bristol that aims to uncover the next generation of comedy performers from the local area. Hosted by Bristolian comedy legend Mark Olver, Episode 3 features the talents of Mark Hurman, Judy Darley, Dan Squire, Neil Green, Angie Belcher and Jem Roberts. If you are an aspiring comedy performer from the Bristol area and would like to get involved with the series, please email bbcspeechbubble@bbc.co.uk with a one page sample of your work, a line about yourself and a contact phone number. Stand-up, sketches, double acts and musical comedy are all encouraged! No experience necessary.